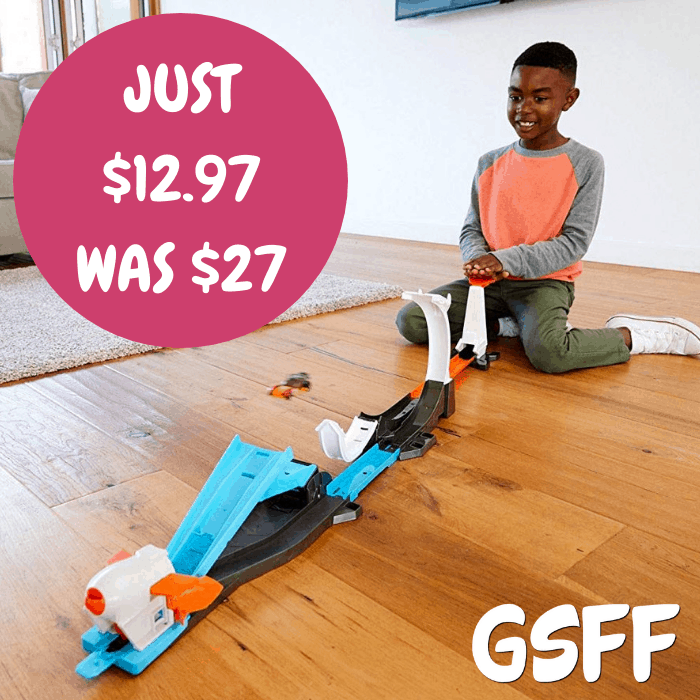 Hot Wheels Track Builder Just $12.97! Down From $27! Shipped! You are here: Home / Instagram / Hot Wheels Track Builder Just $12.97! Down From $27! Shipped! At Amazon, you can score this Hot Wheels Track Builder Playset for just $12.97 down form $26.99 PLUS FREE shipping! Launch thrilling playtime with a transforming set that features multiple challenges and an epic payoff! kids will have a blast completing three stunts to send the rocket flying. First, hit the launcher to speed through the loop and ignite the rocket — one of the engines pops out, and the loop automatically collapses into a ramp. Next, launch the car to jump the monster gap, ignite the second engine, and raise the ramp that preps the rocket for liftoff. Then it’s time for the final countdown — race up the ramp and blast off the rocket cap! this action-packed set provides continuous play with no setup required between challenges, and it connects to other track Builder sets for endless stunting fun! Reconfigure the entire set– all the pieces move around to create different stunts within the set or connect to other parts of your Track Builder world. And you can take the cool rocket anywhere for more fun with other stunts!